Stretton Hall is situated in Hall Lane. It was built in 1664; restored and extended in the 19th century. It was seat of Starkey family and is believed to have been constructed with the material from the demolished, moated Manor House, known as the Nether or Lower Hall. It is now classed as Grade II listed. According to the 1841 census Stretton Hall was occupied by Joseph Morrey a 70 year old farmer with his family, including wife Mary and sons William and John. The tithes map of 1846 records the hall as owned by Lionel Courtier Dutton and occupied by Joseph Morrey, farmer and Peter Lawson an agricultural labourer. In 1850, it was described as being a “curious old structure of wood and plaster with projecting gables”. By 1851 Joseph’s son William Morrey was farming at Stretton Hall, and remained there past 1861. In 1851 Peter Lawson was still living as an agricultural labourer with his family, but by 1861 he had moved to Whitley and was living with his daughter Elizabeth and her family. In 1864 Joseph Smith and family had moved in to Stretton Hall from Stretton House just down the road. Joseph Smith was born in Antrobus in 1822 to James and Mary Smith who were agricultural labourers. Joseph Smith was educated for a short time at Whitehead’s in Antrobus. Disabled by a stiff leg, he started to make his fortune selling sods off Whitley Reed to farmers to cover their potatoes. He progressed into potatoes farming, then moving to Stretton House. During this time he developed a portable threshing machine, moving to Stretton Hall Farm when it fell vacant. In 1871 he had sufficient funds to purchase his own land and in 1872 bought Tan Yard Farm off James Whitlow of Garland Hall, Crowley. He tenanted this out whilst remaining at the Hall. The 1881 census records Joseph Smith as married aged 58, farmer of 151 acres, born in Antrobus. Alongside him were Walter Smith, 24, farmer’s son; Arthur Smith, 20; Frances Ann Smith, 26 and Mary Jane Smith, 22. Joseph Smith employed eight labourers (seven of which were Irish) and two boy labourers. By the time of the 1891 census Joseph Smith was aged 68 and still living at the Hall with his 70 year old wife and family. In addition there were a number of agricultural labourers, seven of whom were Irish. In 1901, Stretton Hall was owned by Mrs Smith, widow of Joseph. She farmed and potatoes were taken in hampers down to London Bridge in Stockton Heath for loading onto the boats for the Manchester Potato Market. Mrs Smith sent cheeses off to the Chester Cheese Fair, sixty at a time. 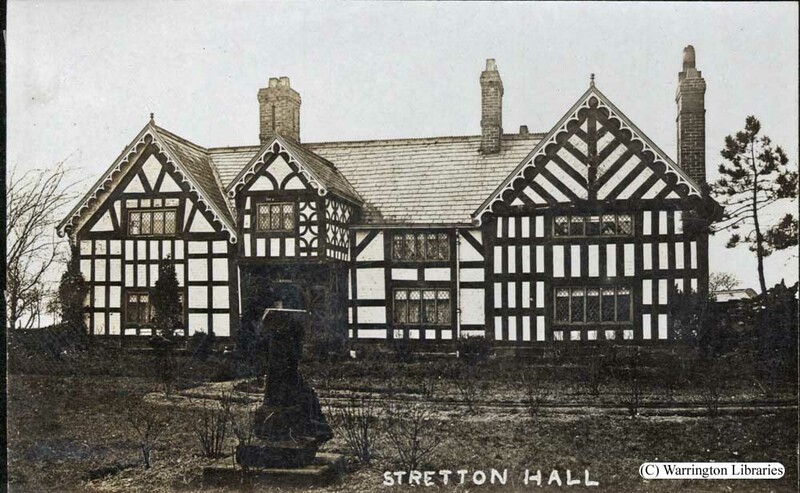 See Memories of Stretton for a personal memory of the Hall by May Bower. In December 1901 Mary Smith died and on the 9 January 1902 the farm contents was put up for auction by their son, Arthur Smith. By the time of the 1911 census William Faulkner, son of Alfred Faulkner of Moss Hall lived at the hall with his two unmarried sisters. From prior to 1939 until after 1945 Joseph’s grandson Frank Ellis Smith was living at the hall along with his wife and widowed mother in law. He was the son of Arthur Smith and married his cousin Beatrice Sankey, daughter of Jacob and Frances Ann Sankey from Moss Wood Hall. Stretton Hall House was sold to the Greenalls in 1950. Until the mid-60s, the Hall was occupied by John, William and Ethel Hughes. John Hughes was the head brewer at Greenalls. Then followed Mr and Mrs Leslie Cussons of the soap making family who were still living there in 1974 and James (Jim) Jenkins. I have a number of old family photographs mainly relating to the time my father Geoff Dooley and his sister Barbara attended the local Stretton back in the 1930’s if you would be interested in copies.